Use a backrest while sitting. Backrest should be high reaching up to the head so as to support the neck; it should not be straight, it should be curved to match the natural contours of the spine. Your spine is not a straight structure, so placing a curved structure on a flat back rest does not cause good pressure distribution. Rest your hands on the armrests of the chair. This partly offloads the spine as the body weight gets transmitted through the upper limbs. 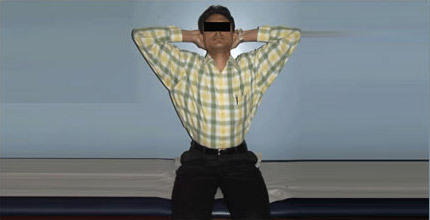 Among all the positions; sitting, standing, walking and lying down, the load on the spine is maximum in the sitting position. So, do not sit continuously; sit for 20-30 minutes, then get up, walk around for about 5 minutes and then sit down. 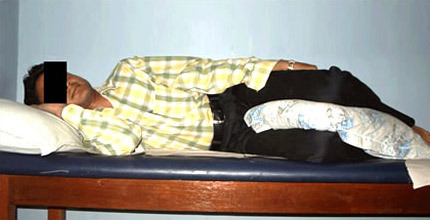 While lying down, it is better to follow the sequence as shown below. This would greatly relieve the stress on your lower back. While getting up, the same principle is to be followed, of course, in the reverse sequence. The ideal position to sleep is sideways, right or left, whichever is comfortable. There should be a pillow underneath the head. Pillow should be just about adequate to support the head [thickness of the pillow=the distance between the side of the head and the shoulder]. Preferably, a pillow should be kept in between the legs as well, as shown above. 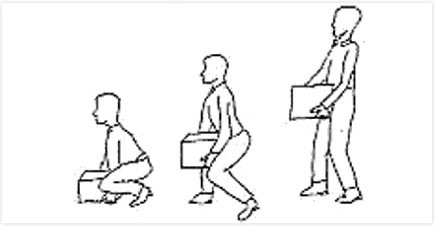 Whenever lifting heavy weights from the ground, it is always better to fold the hips and knees as shown below, to reach the ground and lift up the weight. Keep the weight close to the body so as to decrease the lever arm of the same. 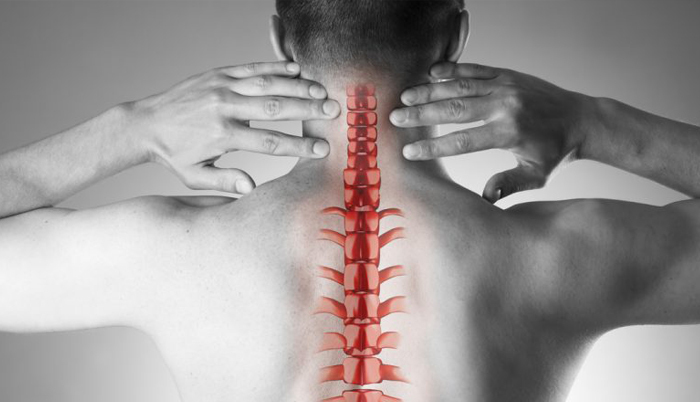 Whenever working on the computer for a long time, it is better to do the following relaxation exercises every 20-30 minutes to give a good break to your neck. Sitting upright, gently bend your neck to the side. Repeat it on the opposite side. Do it for 10 times on either side. Sitting upright, gently shrug your shoulders and attempt to make circular movements in the air with your shoulders. First do this in the clockwise direction and then do in the anticlockwise direction. Repeat this ten times on both the sides simultaneously, in each of the directions, clockwise and anticlockwise. Try to decrease factors that increase anxiety/ stress/ tension since these factors tend to lead to spasm in the neck and back muscles, which would ultimately translate into neck and back pains. In fact, the neck and the back have been referred to as the “mirrors” of the mind. While driving, keep the car seat close to the pedals so that you do not slouch down. For people getting repeated pains in the neck, or in between the shoulder blades, here are a few more exercises. It is better to avoid these exercises in times of acute pain since doing these exercises might flare up the acute pain. 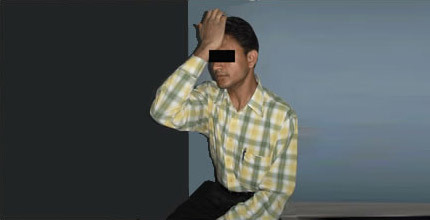 Sitting upright and looking straight forwards, put one hand against the center of your forehead and press against the hand. Do not look sideways and be sure to keep the hand in the center of the forehead while doing this exercise.